For many people, oral health is an out-of-sight, out-of-mind concept — that is, until something goes wrong, such as a tooth cavity or the early signs of gum disease. As we’re sure you’ve heard many times before, prevention is key when it comes to dental problems and oral infections, which is why it’s important to practice good oral hygiene habits at home in between general dentistry appointments. 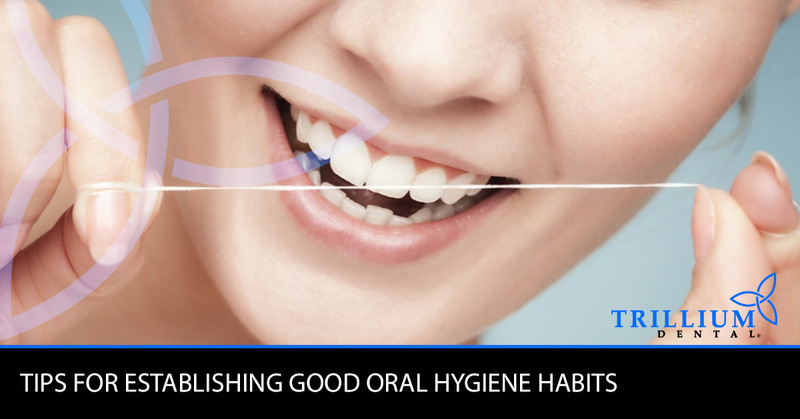 Continue reading for some key tips and tricks for establishing good oral hygiene habits at home, courtesy of our family dentists and dental hygienists at Trillium Dental in Ottawa. People tend to slack on their oral health practices at home if they do not have a set schedule, such as a solid morning and bedtime routine. If you find yourself forgetting to brush twice per day, or if flossing is an issue, try forming a step-by-step routine to follow every single day. Not only will this help keep you accountable with regard to your oral hygiene, but it will also help you structure your days so that self-care and your overall health is a top priority. Hate flossing because your gums are sensitive or sometimes bleed? Remember that the more you floss and brush, the better your gum health will be. Too tired to brush your teeth after a long night out with friends? Don’t let yourself crawl into bed until you’ve washed your face, brushed your teeth, and flossed that sugary plaque away. More often than not, it isn’t a lack of brushing and flossing that is the issue — it’s the thoroughness. Many people give their teeth a quick brush in the morning and at night, flossing only between the teeth that are easy to reach and swishing with mouthwash in an attempt to compensate. The key to good oral hygiene is to be mindful about how you brush and floss, not necessarily how often (twice per day is enough), so be sure to take your time and do a good job. One way to do this is to set a timer on your phone for two minutes, brushing every nook and cranny until your teeth are squeaky clean. You can also find fun hourglasses and sand timers online, which can help you stay on track with how long you’re brushing in the morning and at night. We can all relate to the frustration that comes with flossing those hard-to-reach spaces between the molars, but it’s important not to let this stop you from using dental floss at least once per day. It’s nearly impossible to keep food from finding its way into the spaces between your teeth, which is the number one cause of cavities. Trust us, cavity fillings (yes, even the pretty white tooth fillings) are far more of a pain than making an effort to floss everyday, so do yourself a favor and prioritize flossing when you establish a morning and bedtime routine by doing it every night. Of course, there is only so much you can do at home to maintain good oral health, which is why our dentists and dental hygienists highly recommend visiting our Ottawa dental clinic twice per year for a routine dental cleaning. Contact Trillium Dental in Ottawa to schedule an appointment, or book your dental exam with us online!